The International Reciprocal Trade Association has announced details of its upcoming 31st annual international convention, with the timely theme of �Modern Barter, Leading the Way to Global Economic Recovery.� The event will be held October 28 through October 30, at Pittsburgh�s convenient downtown Hilton Hotel. �The �Modern Barter, Leading the Way to Global Economic Recovery� conference theme will provide an excellent opportunity for us as an industry to demonstrate to the business and financial communities how the process of Modern Trade and Barter is on the leading edge of global economic recovery,� stressed IRTA President David Wallach. Prior to the convention, on Wednesday evening October 27, Greenapple Barter will be hosting their huge Trade Show at the Pittsburgh Convention Center. All IRTA convention attendee companies are invited to participate in this remarkable trading opportunity by taking a booth at the show, which will feature 150 vendors and 1,000 attendees. 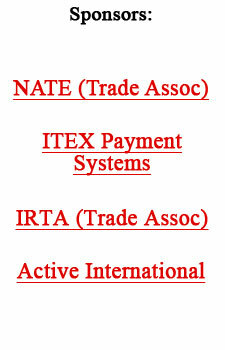 For more info on the IRTA convention and registration go to www.irta.com, or e-mail Ron Whitney at ron@irta.com. � Cash flow is most important as it�s your oxygen. If it stops flowing for more than a brief period of time you�re dead. Obviously you must focus on cash flow. Your profit, market share, or anything else is secondary. One key to success � be very realistic when projecting your revenues. � Barter should play a role in your company�s operational efforts. Methodical planning and execution of your trading efforts will generate additional cash flow, as barter purchases are made for needed products and services. � Use credit for (as) cash, not capital expenditures. Borrow money only to manage short-term gaps in cash flow. Don�t borrow money for large expenditures. You may have to personally guarantee those loans, which is how entrepreneurs end up in personal bankruptcy rather than just closing the business and moving on. � Sell direct and focus on building close relationships. Manage your growth, make your customers your top priority. (Happy customers can be your most effective advertising.) And don�t sell or promise what you can�t deliver. Additionally, focus on establishing relationships to support your growth before you need them. � Remember what business you�re in, you�re not in the business of lending money � so don�t. Get a payment, even a partial, upfront whenever possible. Make it your policy and be clear about it upfront payments. � Be prudent, don�t gamble what you can�t afford to lose. Betting the entire company on one opportunity is gambling. � Don�t hire any paid employees until profits enable you to pay them. Consider finding people who will work for equity or at least a deferred salary. � Lady Gaga has been named chief creative officer of Polaroid. She will be helping develop new products, in addition to her financial stake in the company. � Sarah Jessica Parker is the new chief creative officer of fashion brand Halston (owned by Hilco). � Ellen DeGeneres has a 15% stake in Halo Purely for Pets. The following is an update on Jack Schacht, the former trade exchange founder/owner of Illinois Trade Association (ITA). Known during his barter career for his creativity, Schacht once again has engaged his tireless energy and imagination by building a new instrument for the huge nonprofit community. In the post-recession nonprofit world, donations are down while demand for services is up, and nonprofit organizations (NPOs) everywhere are avidly searching for new, more powerful fundraising vehicles. Enter ShopAsYouGive.com, a new twist on e-commerce fundraising that � according to co-founders Jack Schacht and Jim Novak � pays nonprofit partners three to four times more commissions than traditional affiliate marketing programs. Instead of basing commissions on gross sales, Shop As You Give bases commissions on gross profits. A full 30% of gross profits, to be exact. The company, which cut aggressive deals with more than 100 top manufacturers, employs a 50-60% retail markup. NPO partners share 30% of that markup. Do the math, and it translates to 10-12% of gross sales, as opposed to the standard 3%. That�s a much better deal in any economy. Shop As You Give not only was created with input from the nonprofit community, its advisory board is composed of nonprofit professionals. As a result, it boasts some unique twists and benefits that cater to NPOs. � Each nonprofit can essentially create its own online store, by branding web pages with the organization�s own logo. � NPOs can easily eliminate categories or sub-categories of products that conflict with their mission. � While the store is stocked with thousands of products � including apparel, jewelry, electronic items, and pet supplies � there�s a special emphasis on natural, organic and eco-friendly products, as well as items that are American made. � Prices are competitive. Shop As You Give developed proprietary software that allows it to regularly compare its prices to those of other online retailers. � Participating NPOs will receive ongoing promotions and discounts, which make it easy to publicize the program to supporters. To participate in the program, nonprofits must be licensed 501(c) organizations, reported Novak, VP of Enrollment. The enrollment form is posted on www.ShopAsYouGive.com. For more info or to participate in the nonprofit beta test program e-mail j.novak@shopasyougive.com.